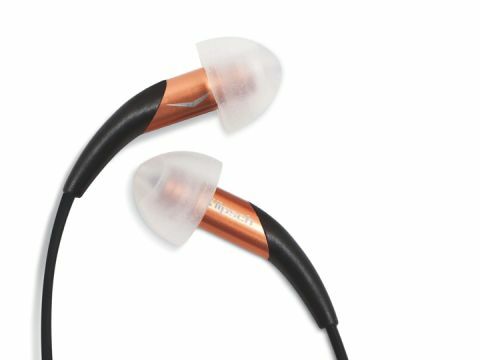 Klipsch states that this is the world's smallest and lightest full-range earphone, so naturally it's got us excited, because small and light so often equates to all-day comfort, a close second to sound quality. ACS T2 at £500, complete with custom-made moulds. In the real world, however, affordable in-ears can't have such tailor-made luxuries, but the £230 X10i still offers a respectable claimed -21dB noise-reduction and a spec sheet that's certainly audiophile-orientated. What truly marks the X10i out from its rivals is its negligible weight (10 grams!) and tiny dimensions, which equate to real ear-canal comfort and a sensation of 'nothingness'. To achieve the low weight, the X10i has an aluminium body, nicely finished with copper anodising. The 'tails' – the black sections at the end – are said to serve as an acoustic damper, cutting noise and reducing stress on the cable. The second rival-bashing feature is the patent-pending bullet-shape ear tips, which not only contribute to the sleek design and low weight, but are arguably the most comfortable in-ear tips we've used. Klipsch has (somehow) packed a full-range, balanced armature-type driver in the tiny chassis and incorporated a bass reflex system, to help with the bottom end. a cleaning tool, and the cable is generous at 1.25m. Users of iPhones can also control a range of functions with the in-line remote. Like the 'Krells of the ear canal', the X10i is beautifully built. Sleek and free from any kind of protrusion, they appear difficult to snag and are a pleasure to use. The intimate fit is glove-like – the most comfortable we've used and is a credit to the designers. Annoyingly, there's a bit of cable microphony and we've also seen some better looking/feeling wires for the money, but the chosen leads do keep weight down and seem to complement the package, overall. There are a number of high-quality rivals out there from big-name brands and so value is a tough one to call, especially since the design is intentionally minimalistic. That said, up close, it's clear to see the classy build, and a value judgement would also have to be based on sound quality – more on this later. We've sampled plenty of in-ears, and yet the X10i seemingly gets the balance just right. Although not the easiest to drive or the most dynamic (not easy for any in-ear), they are natural-sounding, which is all any music lover could hope for. Noise isolation is reasonable; we've heard better and the aforementioned custom moulds are the ultimate if you've the money, but the ergonomic ear-canal fit keeps plenty of noise out by safely going deeper into the ear. Surprisingly, the X10i has the sonic edge on our reference ACS models in silent background conditions, so how and where you'll use your earphones becomes critical. There's plenty of detail here and it's easy to follow the various tracks in a mix. Vocals have a believable quality, with radio-listening also finding favour. Klipsch should rightly be commended for the X10i. It is a clever piece of engineering and one that scores points from a design perspective, too. Under silent background conditions, it's a pedigree performer, but the ear tips' ability to suppress more intrusive noise has its limitations. Luckily, the deep, ear-canal fit combats more than most noise-isolating designs, but it won't keep out the worst of the London Underground, for example. But, if you've been put off by the intimate fit of ear-canal earphones thus far, these would be an easy recommendation, thanks to the ergonomics, lightweight and all-day comfort. For the discerning on-the-go music listener, the X10i is closer to a good, full-size headphone than most and the comfort is simply the icing on the cake.